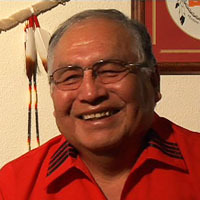 At the time of his interview, Dr. Little Bear, Ph.D., was the President and Dean of Cultural Affairs at Chief Dull Knife College in Lame Deer, Montana. He offers a glimpse into Northern Cheyenne oral history and a tribal perspective on difficult topics, such as Indian Removal and the consequences of the 1887 Dawes Act. Language Diversity versus Science - Richard Little Bear. Changing Elements of Northern Cheyenne Stories - Richard Little Bear. Northern Cheyenne Removal to Oklahoma - Richard Little Bear. The 1887 Dawes Act - Richard Little Bear. Depression Era - Richard Little Bear. 1934 IRA and Cheyenne Government - Richard Little Bear. Termination - Richard Little Bear.